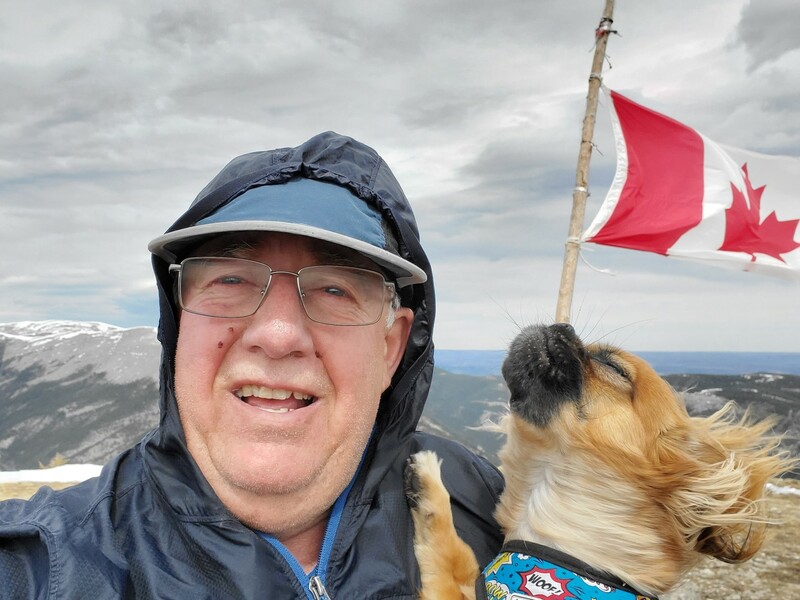 Prairie Mountain – Crazy selfie with struggling dog, wind and new phone. Monday day off after easter. Leisurely walk up in 1 hour 30 min which is ok for 700 m with a 15 month old dog with 8 inch legs on its first ever hike in mountains. Also went down the road the 200 m to start and went up the SW ridge versus straight up from the ditch. From Jack Knife Butte in Bob Creek Wildlands looking south. Grassy ascent ridge to left. 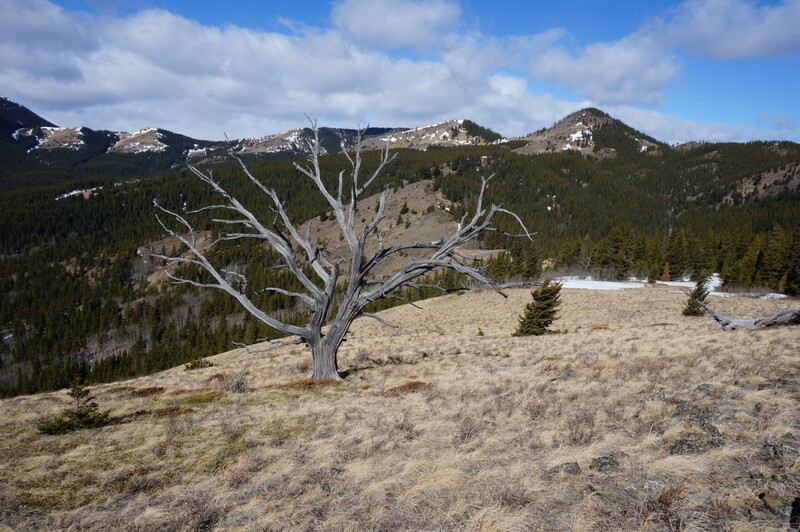 Jack Knife Butte – Great trip- good ridge walking with only a little Mid calf snow in some treed areas. Sunny with great views although windy. Went across Camp Creek on an ice bridge that may not last much longer. Some snow/mud on trails from Bob Creek staging area to camp creek. No ATV’s in area until May 1 but did see some trail riders in the valleys. 19.5 km and 960m total gain. 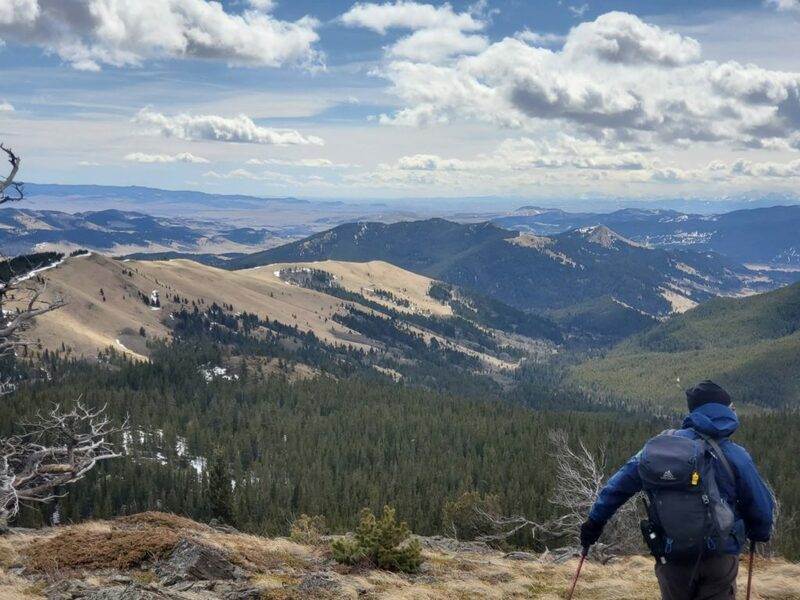 Dave’s comments – With the forecast for the mountain regions rather blustery for April 6th, Bill Kerr and I deferred to the front range foothills, where the forecast called for no precipitation. 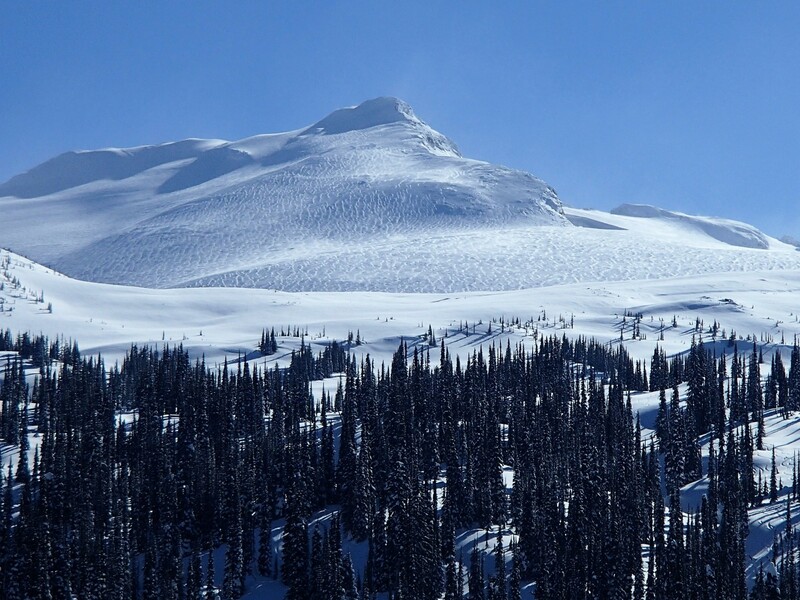 We got lucky and did a sweet ridge walk in the Bob Creek Wildland Provincial Park. 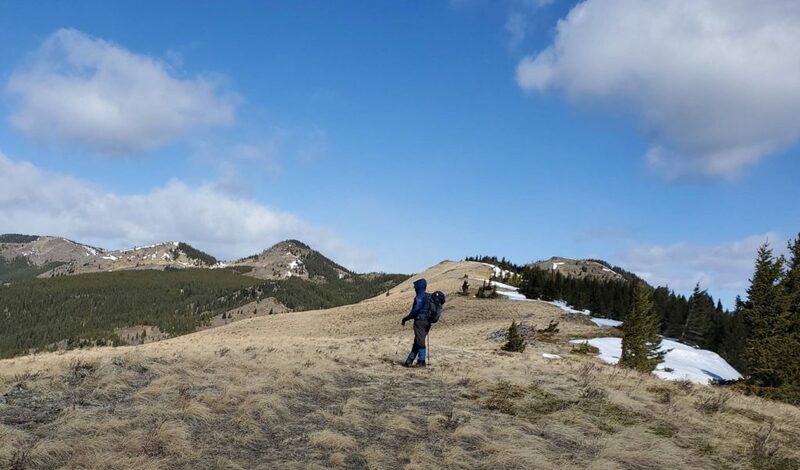 19 kms, 6.5 hrs, 950 m vert and a highpoint SW of Jack Knife Coulee (we’ll call it then “Jack Knife Butte”). It was rather windy most of the day (gusting to well over 100 kms/hr) and we also saw the evidence of a same day cougar/deer interaction that likely did not end well for the deer. The Bob Creek area is sandwiched in between the Whaleback and the Oldman River and has endless kms of ridges for hiking. SSV old Skiout – up 780 m 5.9 km in 2:45 at casual pace staying below 130 HR with 125 alarm. Did a downhill day with Wietse. Playing hockey once per week and 2-3x week on elip. -25 C start and all in shade so cold toes. Up LL ski out and Turned around at halfway hut. 15 km and 535 m . 2.5 km/hr on way in and 9 km/hr on way out. Cold but got some exercise outside. Also one day at SSV downhill. Annual treadmill heart stress test at Total Cardiology. Could have done more but ankle issues and had achieved goals with very close to exhaustion point so began slowdown at 12 minutes. “Bruce Protocol” – treadmill increases angle and speed every 3 min so change at 12 min. Most hit Exhaustion but they also monitor for spiking/ peak BP or max Heart rate or erratic HR. This is really a cardiac capacity test and an anaerobic max test so does not say anything about aerobic threshold or long term aerobic endurance. note hockey on wed 12 shifts x HR of 135 to 158 and felt good. New skis and bindings – but skied like any stiff Volkl ski – maybe a bit light. Carried all the backcountry gear and weight including 2 L water which slowed me down a bit.